Letang is essential to this team. I'm not good with estimating cap situations but I want him signed for whatever it takes. PghSkins wrote: Surely this whole thing has to be a joke to see if Letang can be turned into whipping boy, right? Because I can't imagine it's serious. Well, it got a response because it is so ridiculous. Apparently someone who doesn't know what they're watching. Whatever power play problems Letang may have from time to time this is not the same team without him. I love the Brit Pens Fan Club. To any members of the BPFC here, you folks are awesome! LOL!!! Jussi is a bawse! joopen wrote: Kunitz being used on the PK to prepare for Glass or Adams sitting? Yep, same with jussi. Said that after last game. Beau has given HCDB no choice but to play him. how do you think the fourth line would play out if Bennett isnt scratched? You have to share it with us when you're done! I'm definitely going to forward it to a few people I know! Oh, and can you circumvent any copyright violations and work in Wallace and Gromit? Adams is a liability every time he's on the ice these days. Thanks for the mems; time to sit until needed. Eismann wrote: Adams is a liability every time he's on the ice these days. Thanks for the mems; time to sit until needed. I can't remember one time this season blaming Adams for missing an assignment or not forechecking hard. Adams is used the most on the PK among forwards on the team and it's not very close. He was still the leading PK forward today in ice time. They're simply not going to sit him. Whether people on the message board like him or not, that's how Bylsma uses him. He's not going to sit the guy he's designated as his top PK forward. I think it'll be a decision between playing Kennedy or Bennett, or Glass if they want the extra physicality. Bennett really impresses me and regardless of his being a rookie, it'd be hard for me to sit him over either of the other guys. Of course we are talking about a fully healthy lineup. What are the chances they enjoy that luxury throughout the playoffs? Probably pretty slim. Realistically most of these guys are going to see playing time at some point. Probably all of them if the team really does go deep. Adams is the guy who plays PK the most on team with a mediocre penalty kill. Congrats? LGP needs a new whipping boy... this is the standard "vetting process"
Jussi made a few passes today that were just sick. columbia wrote: Jussi made a few passes today that were just sick. Yes, yes he did. He and Bennett are great playmakers to have with the big two out of the lineup. That combination they had to setup Kunitz in front on the PP was sweet. ExPatriatePen wrote: LGP needs a new whipping boy... this is the standard "vetting process"
He's not a whipping boy. He's a 4th liner who's late to most of the action and isn't close to the impact player for his role that he has been in the past. So who sits when everyone is healthy? Tho, I will say I like the way Glass has been playing lately, perfect 4th line playoff hockey. Steve Dave wrote: So who sits when everyone is healthy? Flip 14 and 9 and possibly 24 and 19 (this one I don't agree with but expect) and you have it I believe. Should Letang rest a bit in the remaining 4 games (play 2?) and give some ice to Despres or Bortuzzo? Would hate to see him get hurt in a meaningless game. It was nice to see traffic in front of the net on a couple of the goals today. 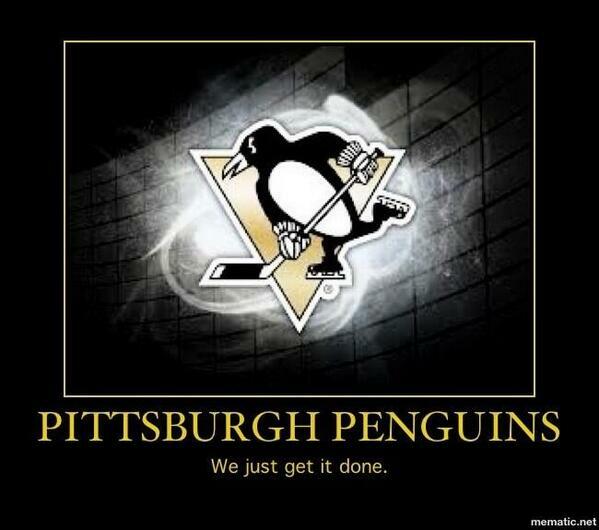 The Pens don't always do something as basic as that even if they pay lip service to attempting to do so. I was working today and only got to see the highlights. From that limited sample, Bennett looked really, really good. He's got skills with the puck unseen on this team outside of Sid and Geno. Yes, I clearly don't know what I'm watching. Thank you. You're going to sit there and tell me that Letang is great on the PP? Lately he's finally coming into his own on the PP. Yes, since he's come back from injury he's been pretty darn good. Prior to that, and in the years past he's been an inconsistent mess. Let's not forget before the injury, there was a time this year that HCDB bumped him down to the 2nd PP unit. Surely that can't be because he's so good on the PP! It was done for a reason, because he was screwing the PP more than helping it and he was very consistent at it. Now he's playing well, you're right, I admit it. He started today like a bag of hammers on the PP and cleaned it up and was responsible for helping us win this game. He's been great since he came back from the injury and that's exactly what we need. You know and I know, that the guy could barely hit the net, was completely indecisive with the puck, couldn't lay a one timer pass, dusts the puck off before he shoots it, and just anything else that screwed up the PP in the not so distant past. Now he's playing well and everyone is ignoring how he shat the bed on the PP earlier this season? If he can keep up this consistent play on the PP my hat is off to him, this is exactly what we need and what I expect of him. The guy is talented, he has a great shot, he has great hands, he's offensive, and I just want to see those tools used properly....and that's what he's been doing lately! So yes I do know what I'm watching, I'm watching a guy that struggled recently on the PP, starting to figure it out and use his talent to be an effective PP player...and I like it.